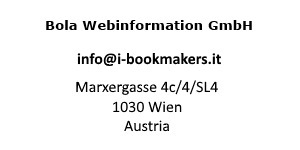 I-Bookmakers è un sito creato appositamente per chi sta iniziando a piazzare scommesse sportive ed anche per quegli scommettitori che sono interessati a scoprire novità da questo mondo. Offre anche un servizio professionale e completo confrontando tutti i migliori operatori italiani e stranieri in possesso di una licenza AAMS. The protection of your personal data is a matter of particular concern to us. We therefore process your data exclusively on the basis of the statutory provisions (GDPR, Austrian Telecommunications Act [TKG] 2003). In the present data privacy statement we provide information about the most important aspects of data processing within the framework of our website. When you contact us using the form on our website or by email, the data you provide is stored by us for a period of one year to enable us to process your inquiry and any follow-up questions you may have. We will not pass on your data without your consent. If you do not want cookies placed on your device, you can change the settings on your browser so that it informs you about the setting of a cookie and you only permit this in the individual case. If you deactivate cookies, the functionality of our website may be restricted for you. Our website uses web analysis services such as Google Analytics (Google Inc, 1600 Amphitheatre Parkway, Mountain View, CA 94043, USA), Clicktale Ltd. (Tel Aviv, Atrium Tower, 2 Jabotinsky Street, Ramat Gan, 5250501 Israel) and eTracker GmbH (Erste Brunnenstrasse 1, 20549 Hamburg, Germany). In the context of these services, cookies are used which permit an analysis of the use of the website by its users. The information generated is transmitted to the server of the web analysis service provider and stored there. We have concluded a corresponding agreement with the service providers in regard to order data processing. Your IP address is recorded, on the basis of the legal principle of the existence of a "legitimate interest" (e.g. for reasons of server security), but normally it is not used. Our relationship with the web analysis service providers in third countries is based on the "Privacy Shield" agreement with the USA or the adequacy decisions of the European Commission. Data are processed on the basis of the statutory provisions of § 96 (3) TKG and Art 6 (1) a) (consent) and/or f) (legitimate interest) of the GDPR. Our objective, as envisaged in the GDPR (legitimate interest), is the improvement of the presentation of our goods and services and the optimisation of our web presence. The user data are preserved for a period of 14 months. Plugins of the social network Facebook, 1601 South California Avenue, Palo Alto, CA 94304, USA are to some extent integrated on our website. Facebook plugins can be recognised by the Facebook logo or the "like" button on our website. An overview of Facebook plugins can be found here: http://developers.facebook.com/docs/plugins. If you visit a corresponding page, a direct connection is established by the plugin between your browser and the Facebook server. As a result of this, Facebook is informed that you have visited our website with your IP address. If you click on the Facebook "like" button while you are logged into your Facebook account, you can link the content of our website on your Facebook profile. This enables Facebook to allocate your visit to our website to your user account. Please note that as the host of this website we have no knowledge of the data that is transferred or how Facebook uses this information. Further information on this subject can be found in the Facebook data privacy statement at http://de-de.facebook.com/policy.php. If you do not want Facebook to be able to allocate your visit to our website to your Facebook user account, please log off from your Facebook user account. Using the Google +1 button, you can publish information worldwide. With the Google +1 button you and other users receive personalised content from Google and our partners. Google stores not only the information that you have entered +1 for content, but also information about the website you were looking at when you clicked +1. Your +1s can be shown as tips together with your profile name and your photo in Google services, for example in search results or in your Google profile, or in other places on websites and advertisements on the Internet. Google records information about your +1 activities in order to improve Google services for you and others. To be able to use the Google +1 button, you need a globally visible and public Google profile containing at least the name you have chosen for your profile. This name is used in all Google services. In some cases this name can also replace another name which you have used to share content via your Google account. The identity of your Google profile can be displayed to users who know your email address or who have other identifying information about you. Use of the information recorded: in addition to the above uses, the information provided by you is used in accordance with the applicable Google data protection provisions. Google may publish aggregated statistics about the +1 activities of users, or pass these on to users and partners, such as publishers, advertisers or linked websites. Twitter functions are embedded on our website. These functions are offered by Twitter, Inc. (1355 Market St, Suite 900, San Francisco, CA 94103, USA). When you use Twitter and the "retweet" function, the websites you have visited are linked to your Twitter account and made known to other users. Data is also transmitted to Twitter. Please note that as the host of this website we have no knowledge of the data that is transferred or how Twitter uses this information. Further information on this subject can be found in the Twitter data privacy statement at http://twitter.com/privacy. You can change the privacy settings for your Twitter account at http://twitter.com/account/settings. You have the option of subscribing to our Newsletter via our website. In order to send you our Newsletter, we need your name and your email address, and a statement by you that you agree to receive the Newsletter. As soon as you have registered to receive the Newsletter, we will send you a confirmation email with a link to the confirmation of the registration (double opt-in). To send you the Newsletter and other email services, we use the service provided by AWeber Communications, 1100 Manor Drive Chalfont, PA 18914, USA. The data provided by you are sent to AWeber and stored there. After you have registered for the Newsletter, you will receive an email from AWeber. In this email you must confirm your registration for the Newsletter or for our email services. AWeber offers extensive possibilities for analysing how the Newsletters are opened and used. These analyses are not used by us for evaluation. Further information about AWeber and data privacy at AWeber can be found at http://www.aweber.com/privacy.html. In principle, you have rights to access, rectification, erasure, restriction of data processing, data portability, withdrawal of consent and objection. If you believe that the processing of your data represents a breach of data protection regulations, or that your rights under data protection law have been violated in any other way, you can file a complaint with the supervisory authority. In Austria, this is the Data Protection Authority [Datenschutzbehörde].